These high-performance palletising robots are developed based on Okura's sophisticated palletizing technology & long track record in the field. 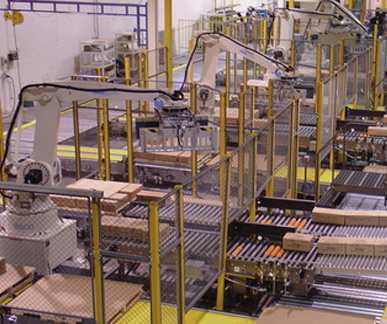 It is important to note that Okura ONLY manufacture palletising robots and therefore the full focus of specialist features and techniques for palletising have been perfected. Optimum offers a large variety of end effectors to ensure on the effective & secure handling of all products. These end effectors can handle a wide range of products in a safe, stable & non-damaging manner. Handling type includes clamp, fingers, vacuum & sliding plates. The Okura Robots are 4-axis multi-articulated design achieving speedy & accurate palletizing of various types of products. Its low space utilization & various end effector designs for a wide range of usage makes the Okura robot palletiser suitable for any modern factory environment. 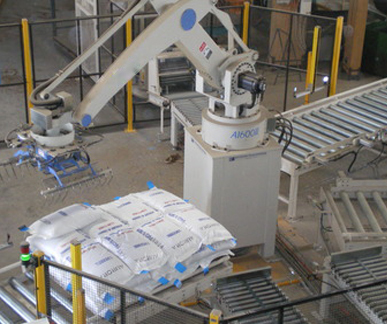 From industries as far-ranging as Food and Beverage, building, stock feeds to petrochemical, the Okura robot palletiser can reliably & efficiently palletize the manufactured products securely & compactly for transportation. These handled products can be in the forms of bags, cartons, pails, crates & many other types. The total effective handling load for the standard Okura robot palletiser of 140 kg (including end effector weight of kg) is sufficient for most applications. The correct selection will result in the most reliable and cost effective solution in the long term. If you'd like more information or if you have any enquiries about the Robotic Palletiser, please call 1800 066 008 or click HERE to contact us online and we will contact you.